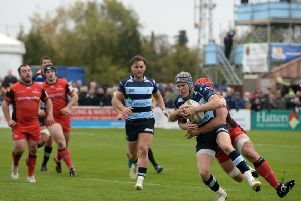 A hat-trick of tries from Stephen Woodhead saw holders Bedford Athletic beat Kettering 29-12 in the East Midlands Cup quarter-final on Saturday, writes Jeremy Tyrrell. The hosts made a perfect start as Steven Smith, restored to inside centre, cut through for the opening try in the second minute. This wasn’t a cue for the floodgates to open, although Ath had dominated possession only for a high penalty count to frustrate their progress. Woodhead crossed for the first of his tries to make it 10-0 at the break, before Kettering were on the scoresheet early in the second period, Josh Luthayi crossing. However, Bedford emphasised their superiority, Woodhead scoring his second try of the day to give his side some breathing space. Captain Rob Watkins put the result beyond doubt in the 67th minute with a try that was converted by James Hawken to make the score 22-5. Shane Ling did grab a consolation score for Kettering as he burrowed over from a line-out catch and drive, Ben Hanger converting. The final score of the day went to star man Woodhead as he completed his hat trick, Hawken converting to put the seal on the win. Bedford Athletic host Longton this weekend.